K-433 Svyatoi Georgy Pobedonosets is a Project 667BDR Calmar nuclear-powered ballistic missile submarine (SSBN). The submarine was laid down on August 24, 1978 at Sevmash shipyard (Severodvinsk) under the name of K-433; launched on June 20, 1980; commissioned into Northern Fleet on December 31, 1980; transferred to Pacific Fleet on November 3, 1983; obtained the name of Svyatoi Georgy Pobedonosets on September 15, 1998. 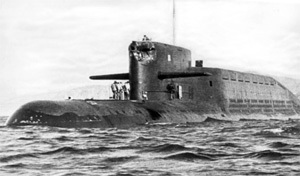 In Oct – Dec 1983, firstly in the history of Russian Navy, the sub carried out underice transarctic interfleet cruise from Northern Fleet to Pacific Fleet in conditions of polar night, having sailed round the North Pole and covered shallow Chukchee Sea in submerged position. On Dec 4, 1984 the sub was rewarded with defense ministry's pennant "For courage and military merit". In Feb 1993 – July 2003 the sub was under interim overhaul at Zvezda shipyard in Bolshoi Kamen, Far East. On July 12, 2005 Russian Orthodox Church took the sub under patronage. On Sept 25, 2008 Russian president Vladimir Putin inspected the sub and answered the crew's questions. On Oct 6, 2009 the sub launched ballistic missile RSM-50 from the Sea of Okhotsk against Chizha Range. The submarine is armed with four 533-mm and two 400-mm bow torpedo tubes (combat load is 16 torpedoes or 24 mines); 16 launch tubes of R-29R ballistic missiles; MANPADS Strela-2M launchers.